Most people are deathly afraid of speaking in front of a crowd (whether or not the crowd is in their underwear). 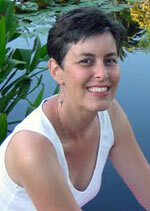 Lisa Braithwaite is a cool coach and blogger who helps people get better at public speaking. She notes that the fear of looking foolish, the fear of trying new things, and the fear of standing out are all symptoms of Adultitis, which she works hard to alleviate in her clients, as she gives them tools to help their anxiety melt away. FTERA is about always wanting or needing the next thing to come along. We can’t be content to be satisfied with what’s already accomplished; we have to constantly be grasping for the next event/activity/project. When you write a book, it’s always neat to hear what aspects of it managed to grab someone. I found it pretty cool that a lot of the themes that struck Lisa were written by Kim, who often downplays her writing skills. I try my best to pooh-pooh that notion (and also try my best to use the term “pooh-pooh” as much as possible). But, as husbands out there know all too well, our opinions seem to weigh less with each passing year. I’ve always believed that Kim’s contribution added a TON of perspective to the book (and this blog), but I’m grateful to have Lisa back me up on that one. 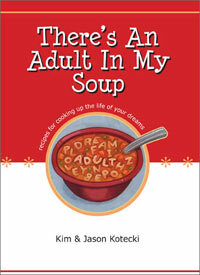 Pick up your very own copy of “There’s An Adult In My Soup,” filled with short bursts of inspiration, witty and wise life balance advice, and over 50 fun illustrations. Haven’t been able to read the book yet guys – but if that’s a preview then it sure hits the nail on the head. Stress begets stress – yikes is that ever true. I see it happen over and over, with me and those around me. And busy is truly a 4-letter word! So many people seem proud of being busy. “Oh I’m just too busy to do that. Maybe next time.” When you say that about every get together and event, it’s time to re-evaluate. Hey, thanks for pointing to my review of the book. I know it doesn’t seem, on the surface, like what I do and what you do are so closely related, but ever since I first came across your blog, I recognized the parallels. We anti-adultitis types have to stick together! I agree, Lisa! Thanks again for the review!